It’s Time for Obama to Fire DeMarco—Will He? There will be no write-downs at Fannie Mae and Freddie Mac, and DeMarco's opposition appears to be inflexible. Fannie Mae and Freddie Mac won’t reduce the principal of underwater homeowners—FHFA head Edward DeMarco made that official yesterday. Despite the fact that FHFA analysts concluded this week that forgiving certain mortgage debts could save public money, DeMarco said yesterday he would not allow it because of the “costs and risks”—he is particularly concerned that people might strategically default to qualify for help. A borrower who defaults cannot be certain that he and she will obtain a HAMP modification, much less…principal reduction. Therefore, a borrower would take a substantial risk be deliberately defaulting: they would have to choose to damage their credit for years to come and perjure themselves on the chance that they would be found eligible for the program. But bankers always worry about these phantom defaulters. “This is something you often see among bankers and lenders who view any sort of write down as the unacceptable breaking of a contract,” notes Bernstein. Democratic critics—who have for months been hammering DeMarco for his obstinacy—are now focusing on his apparently ideological opposition to principal write-downs. “We are five years into the housing crisis, and FHFA remains paralyzed by the fear that somehow homeowners innocently trapped in the worst economy since the Great Depression are going to weasel out of paying every penny on their mortgage that they could,” said Representative Brad Miller in a statement. In a way, DeMarco is making his position more untenable by opposing write-downs on ideological grounds. That’s not something that can be easily rectified—as opposed to having complaints about technical aspects of the program. Obama has the power to replace DeMarco whenever he wants. 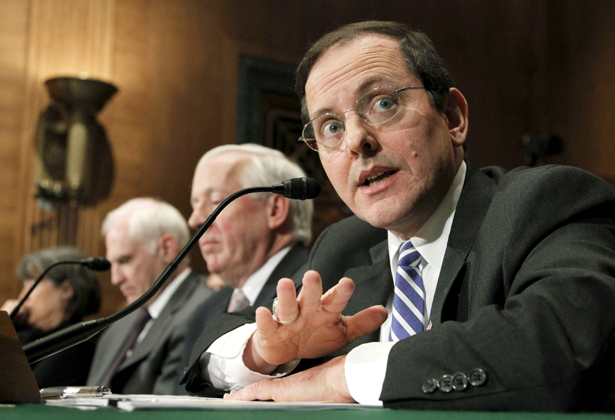 Since DeMarco is only Acting Director of the FHFA, Obama can simply nominate a permanent one. That person would have to clear a Senate confirmation vote, which won’t happen this year (but might be an interesting fight to have in an election year anyhow). Moreover, Obama could use a recess appointment to install someone else. Progressives have been pushing hard on the White House to replace DeMarco—and now that DeMarco has dug himself in, why not do that, especially now that he has gone through the motions of considering and then denying write-downs. Many progressive critics of the administration correctly note that for years, the administration opposed principal reduction too, and has only recently come around to it. So was that a true policy evolution, or political theatre in an election year? Forcing in an FHFA chief who will do principal reduction—or failing to install that person—would go a long way to answering that question.